In some parts of the country the first signs of spring are already showing. In colder places there is some time to go yet, but it is not too soon to start some planning, and even start some work to prepare your garden for its best season yet. In milder areas February is the ideal time to start pruning, and in colder areas, March or very early April are best, as the first rule of gardening in cold climates is not to stimulate growth too soon, in case it is damaged by the return of harsh weather. Besides the traditional ‘spring clean-up’ of removing dead leaves, raking lawns and cleaning paths and driveways, the most important spring activity is preparing our shrubs for the coming season. You probably have a variety of them, so here are some tips and techniques for deciding what to prune, and how to prune them. Controlling size – this should not be a primary goal – if it is you have probably chosen the wrong plant for the spot. It is however possible to keep a plant within its normal size-range by pruning. 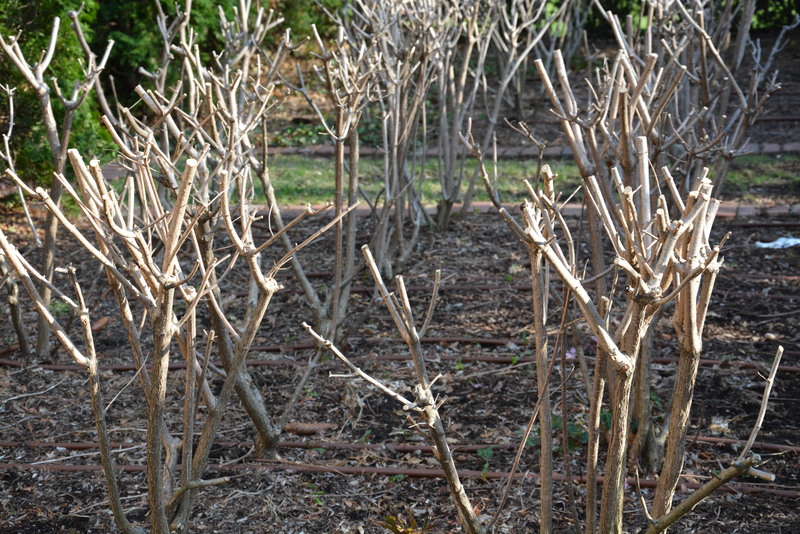 Rejuvenation – pruning encourages the growth of new stems, keeping a plant younger and more vigorous and delaying ageing. Encouraging flowering – this is obviously a major reason for pruning, as we want the most flowers possible on our plants. Good pruning will keep a plant carrying plenty of flowering wood. For most shrubs, flowering happens in two ways. Some plants flower at the ends of new shoots that come from the stems in spring. Others flower by sending out short flowering shoots from existing stems that are one or more years old. The flowers buds on those stems formed in the previous year and are sitting dormant on the plant. The simplest rule to follow is this one, “flowers in summer, prune in spring. Flowers in spring, prune in summer.” Spring flowering covers the months up to May or June, depending on your local climate. Let’s look at some different plants that are pruned in late winter or spring, and see, with different ones, how to best develop the features we want. Dwarf Spirea – this group of plants includes popular flowering and foliage plants like ‘Gold Mound’ or ‘Little Princess’. These are grown for their foliage color, such as the bright yellow of ‘Gold Mound’, or for flowering effect. They bloom mostly on shoots that come from wood grown in the previous year, and since they are fast-growing, with many thin twigs, they can quickly become over-grown. When pruning we want to rejuvenate them and encourage flowers and bold new foliage. The first step is to remove most of the branches older than one or two years. Cut out most of the thick, old stems, leaving the younger ones that are lighter in color. Cut back to the base of the plant, or to a spot where a newer branch is growing from the old stem. Even if you do this each year, as you should, you will be removing quite a few branches, and the plant will look very open. At the same time, cut back those younger stems to a place below all the thin flowering stems on them. You might be cutting back ⅓ to ½ of the branch. When you are finished you should have a short plant, with well-spaced straight stems radiating upwards from the center. The ‘Bridal Wreath’ type of spirea are pruned in summer, immediately after they have flowered. Roses – this applies to bush roses, as climbing roses are pruned in summer. The traditional types of roses – Hybrid Tea and Floribunda – are pruned hard in spring. Remove about ⅓ of the old stems right at the base. Cut back the remaining stems to between 3 and 9 inches in length. Thin stems should be cut short, thicker stems can be left longer. Always cut back to an outward-facing bud. This is pruning to maximize the production of large flowers. For modern roses, like the Knockout Roses, and others grown for landscaping, simply remove a few of the oldest branches, which will help rejuvenate the plants, and trim the remaining stems lightly, just back to a point below the numerous flowering shoots at the top of the branches. Again, cut back to an outward-facing bud. Dogwood shrubs – these are good examples of plants grown for stem effect. We admire the red or yellow color of the bark on young twigs, so we want plants with lots of long, young branches. To achieve this, most gardeners cut the plants right down to the ground every second or third year. This causes many young shoots to grow up, reaching 3 feet or more in a single season. The next year they will produce side-branches, still looking colorful. After that the bark will thicken and only short colored stems will be produced. Time to cut back to the ground again! If you live in a very cold area – and these plants are hardy in cold regions – or if you have drier soil, and so don’t have vigorous growth, modify this by removing about ½ the branches every second year – take out the oldest ones right at the ground. Hydrangea – there are several different groups of hydrangeas, and each needs a different type of spring pruning. First the mophead type, with large dome-shaped flower heads, usually of pink or blue. These flower on older wood – although some of the newer varieties, like ‘Red Sensation’ or ‘Endless Summer’ will flower on new shoots too. When pruning, try to preserve a foot or so of the stems from the previous year. Remove all the old stems at the ground and cut back those newer ones to the first pair of fat buds you see on the stem. With the panicle type, often called ‘P.G. hydrangea’, such as ‘Limelight’, or ‘Tardiva’, these are pruned into a permanent framework of older branches, which can be several stems from the ground, or one tall stem, creating what is called a ‘standard’. The younger branches from the previous year are cut back to just an inch or two in length. The tall new stems that come from the buds at the base of last year’s stems will carry large blossoms. If you are still building that permanent framework, of course you will leave some stems longer. Choose strong branches for this, as weaker ones left unpruned will often die. The oakleaf type, such as ‘Alice’, form their flower buds at the end of stems produced the year before. The only spring pruning needed is to remove any dead wood. Do not cut the top off any stems in spring. Some gardeners grow this plant for its magnificent foliage and fall color, not bothering much about flowers. In that case they are best treated like the dogwood shrubs, and cut back to the ground, either completely, or removing ½ the branches each year. The leaves will be very large, and really show their unique qualities well. There are many other summer flowering shrubs that are pruned at this time, but almost all follow the ‘model’ of the ones discussed here. Good luck doing your pruning – you will be amazed at how much more flowering you will see this coming summer and fall.